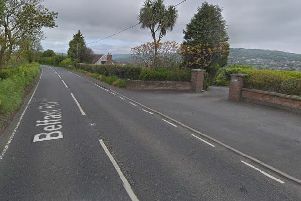 Larne residents are being warned to be vigilant against bogus callers, after a family of vulnerable adults were targeted by heartless thieves. The victims, who did wish to be identified, were at their home in the Antiville area around 2pm on Tuesday, August 11 when two men, purporting to work for the NI Housing Executive, called at the property asking if they could clean the guttering. The householders refused the offer as the men were unable to provide identification. But the opportunistic con men would not take no for an answer. A source close to the family told the Times: “Some of the people living at the property are adults with learning difficulties. These men obviously saw this and took advantage of the situation. “One of the men pushed his way into the house and demanded money for work which he claimed had been carried out at the rear of the property. He was quite aggressive and so they gave him a small sum of money to try and get rid of him, but he demanded more cash. “He was told he was not getting any more money and left, but it was later discovered that a money box containing about £300-£400 had gone missing. Police confirmed they are investigating a distraction burglary in the Antiville area. Detective Chief Inspector Richard Carmichael explains: “At no time did these males present identification and police enquires to date would indicate that they did not represent any official housing body. “The first male is described as wearing a black shirt, jumper and trousers, while the second was shorter than the first and wearing grey jogging bottoms and a grey sweatshirt. “We are keen to speak with witnesses or anyone with information. The number to call is 101. Meanwhile, a spokesperson for the Housing Executive told the Times it would be issuing a warning on its website and via social media. The organisation said it would also advise staff working in the Larne area to remind tenants of the dangers of cold callers. The spokesperson added: “We have been made aware of this problem in other areas in recent months. Tenants should be extra vigilant as bogus callers are increasing and theft is usually their aim. “These bogus callers will frequently claim to be from a public body like the Housing Executive or a contractor. Residents should not allow anyone to enter their home without proper identification. “There are no maintenance or housing schemes currently in the area that would warrant access to a tenant’s home. Our staff and contractors, and those from other public bodies will have a photographic identity card. Check this carefully, if they have forgotten their ID card they will understand if entry is refused.